The jet engine, as used by the majority of today’s aircraft, is the most familiar use of the gas turbine engine, but gas turbines are also used in trains, ships, tanks, and alongside steam turbines in power stations to generate electricity. In a gas turbine engine, a pressurized gas — usually air — is used to spin the turbine. Air that enters the engine is mixed with a burning fuel such as propane or jet fuel. The heat produced by the burning fuel causes the air to expand and rush past the turbine causing it to spin. A gas turbine engine has a greater power–to–weight ratio, and can produce the same power with a smaller engine than a conventional reciprocating (piston) engine. Unfortunately gas turbine engines have their disadvantages too. Typically turbines can spin at over 10,000 rpm – with speeds exceeding 100,000 rpm not uncommon in smaller turbines, this combined with the high temperatures the engine is subjected to make designing and manufacturing gas turbines expensive. Gas turbines operate most efficiently under a constant load and a gas turbine will use more fuel that a reciprocating engine during idle, or if the load fluctuates. 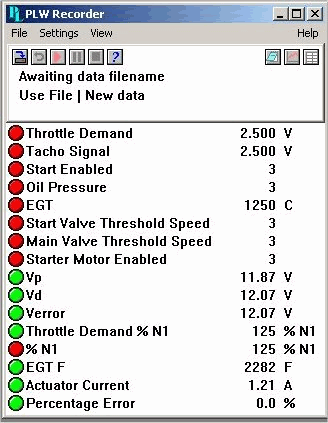 A Pico data logger was used to log various parameters of an Auxiliary Power Unit for the purpose of keeping records of the engine speed and turbine Exhaust Gas Temperatures — important for safe operation of the engines, and to allow PID speed control systems to be analysed and adjusted for stable operation. The Auxiliary Power Unit or APU was originally used in Military applications, as the prime movers for either ‘air producers’ or for electrical generators. These small turbines offer low weight, high power output and use the same oil and fuel as the main engines in helicopters and jet aircraft. The ‘air producer’ is basically a turbine powered low–pressure high–mass flow compressor. The compressed air is ducted to a small cold air turbine, which is connected to the main engine in order to spool it up to starting speed. As an electrical generator, the turbine can be started and run continuously to provide ground power to the aircraft in order to keep it combat ready. When the aircraft is despatched for its mission the APU switches from ground power generation to engine start mode. Throttle demand — the throttle is a potentiometer which sets the target speed for the turbine. The Pico data logger logs this voltage directly. The turbine is controlled by the PID controller to keep the speed constant for electrical generation, or the air delivery constant for engine starting purposes. Tachometer Signal — the turbine is fitted with a magnetic pick up, usually somewhere in the reduction gearbox, with which to measure the turbine shaft speed. This is of fundamental importance (along with the Turbine Inlet Temperature) in maintaining the life and safety of the engine. The output from the magnetic pick up is a pulse train; this is converted to a voltage which is then logged by the data logger. The tachometer output is also essential in characterising the dynamics of the turbine under acceleration and load to enable initial gain constants for the PID controller to be established. Start Enabled — this simply logs when the start switch was pressed, and acts as a start of cycle indicator. Oil Pressure — once the start switch is pressed, the turbine will be accelerated by its electric started motor. At some point, the oil pump in the turbine gearbox will establish a safe minimum oil pressure. This closes a relay, which is logged, and also enables the ignition. If oil pressure is not established, the ignition cannot be enabled. EGT — Exhaust Gas Temperature. This parameter is measured using a thermocouple in the exhaust. The raw thermocouple voltage is amplified and scaled to provide a real–time display of the temperature in Celsius, and is also logged. The temperature also is one of the control loop inputs, to prevent sudden throttle changes from exceeding the turbine limitation. Start Valve/Main Valve threshold speeds — as the engine accelerates in the start phase, the increasing rotor speed is detected, and at various stages valves are automatically opened to admit fuel to the combustion chamber. This helps to keep the turbine below its limitation, even though the PID control loop may be demanding maximum fuelling. These speed thresholds are logged. Starter Motor Enabled — at some point in the acceleration phase of the start cycle, the starter motor is no longer required, and is de-energised. This ‘speed threshold’ is logged also. Vp/Vd/Verror — the output signal from the proportional and derivative terms, and the loop error are logged so that the dynamics of the system can be determined, and the stability and transient response of the system optimised (the integral term is not logged in this particular set up). Throttle Demand % N1 — it is convenient and conventional in turbine applications to express rotor speed in the percentage of the maximum rated shaft speed. In multiple shaft turbines, there would be a number ‘%N’ indications, %N1 %N2, etc. %N1 — the actual rotor speed is displayed as a percentage of maximum rated speed. EGT F — as the turbine is American and the analogue instrumentation is in Fahrenheit this shows the Exhaust Gas Temperature in Fahrenheit. Actuator Current — the fuel supply is controlled by a proportional actuator valve which is current controlled. The actuator current is logged to establish the system gain to be measured. Percentage Error — the difference between the Throttle Demand and actual rotor speed %N1. This is nice to observe when, for instance the PID integral term is switched on, and the error tends to zero. PID is an acronym for Proportional, Integral, Derivative. In simple terms, PID controllers operate by measuring the input of a device and then maintain this at a set level by making changes to the output, by doing this the PID controller eliminates the need for the operator to make continuous adjustments in order to maintain a stable system. 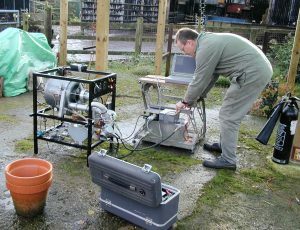 For use with the turbine system a PID loop controller was constructed and the data logger was used to test its effectiveness whilst the turbine was operating. 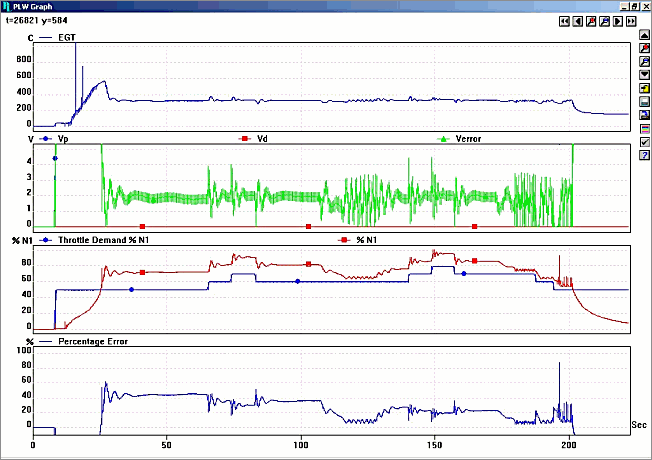 Using PicoLog data logging software a graph of the test results was produced, as shown below (Figure 4). From the results it can be seen that early on in the test, the loop error is large (throttle demand is 50% and the actual speed is 72%) and also the engine response is oscillatory to step changes in throttle. At about 110 seconds into the test, the proportional gain of the PID circuit is increased. This increase causes and associated decrease in the loop error, but the system becomes unstable, so the proportional gain is reduced again at about 130 seconds. The logged data shows just how bad the initial design of controller was, and significant development work was required to achieve the required balance of accuracy and stability. This application notes was submitted by Roger Marmion — for full details of Roger’s projects with gas turbines visit his Gas Turbine Project.